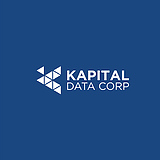 The purpose of this certification is provide a direct link between Corporate America, Public Sector Higher Education Clients and minority-owned businesses like Kapital Data Corp. Many Fortune 1000 companies in America have supplier diversity programs in place. These programs are specifically designed for large companies to source products and services from minority owned businesses. They do this in an effort to keep their businesses in line with the shifting demographic profile of our country. These companies recognize that a diverse supply base offers a competitive advantage in today’s multicultural business economy. In other words, large corporations are constantly looking for minority owned businesses to work with. 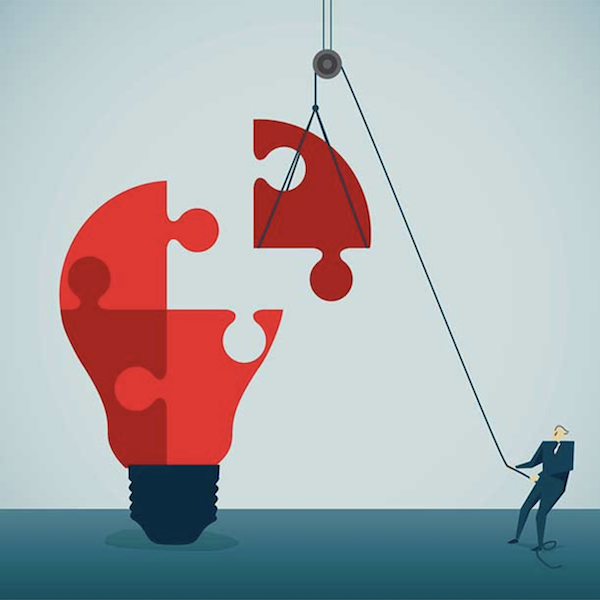 They have supplier diversity programs in place to calculate exactly how successful they are in sourcing products and services from minority suppliers. Therefore one of the top benefits of MBE certification is that any contractual agreement between a corporation and Certified MBE is counted towards that corporation’s supplier diversity goal. 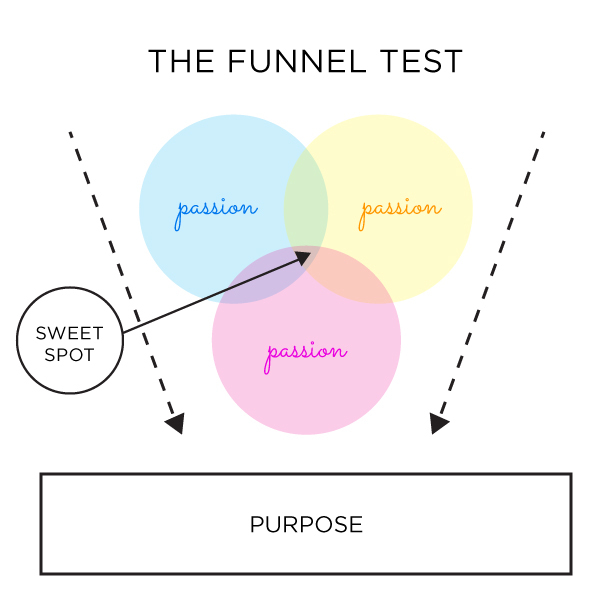 The more they spend with Certified MBEs, the closer they get to achieving and surpassing their goal. But you have to be a Certified MBE in order to count towards corporate diversity spending. 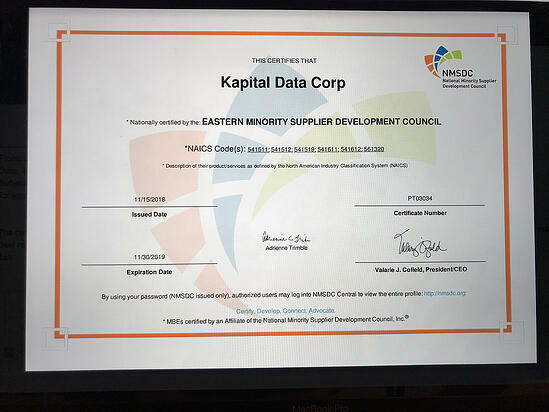 The National Minority Supplier Development Council (NMSDC) is the only national organization providing certification throughout the U.S. where MBEs are genuinely minority-owned and operated, and ready to do business. 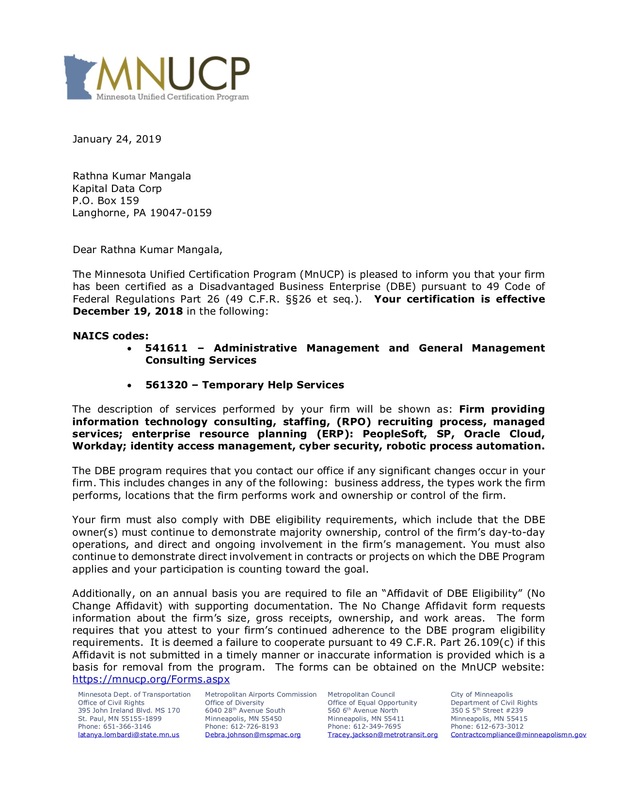 With this certification, Kapital Data is recognized as a Minority Business Executive (MBE) by one of the most widely recognized agency - NMSDC!